However, more recent "blue ice" sampling in the Allan Hills of Antarctica, reveals that CO2 did not exceed 300 ppm in the last 1 million years. Source: Live Science. The NOAA/ESRL monthly global CO2 captures the trend in the variability due to ENSO change and human emissions increases. 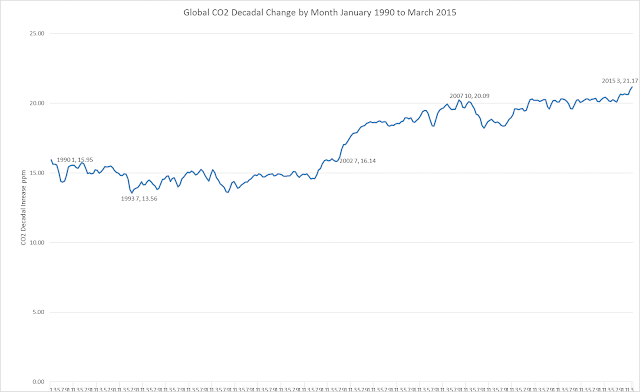 The following chart depicts the change in CO2 by month compared to prior year from January, 1981 to March, 2015. The increasing CO2 trend from 1981-2015 is apparent. March, 2015's increase of 2.73 ppm over March, 2014 is one of the 21 months of readings that are equal to or higher than that rate of change. All of these months are clustered into El Nino related changes, a loose correlation to significant jumps over the prior year's reading. The problem is that annual increases by month from prior year only reflect a short term change, with considerable variance. decadal change between two months 10 years apart. The following charts the change of any month compared to the same month 10 years prior to that date. The change from January, 1980 to January, 1990, was only 15.95 ppm. Given the fall of the Soviet Union, and ENSO neutral and La Nina months, by July 1993, the change from the same month ten years before was only 13.56 ppm. This decadal rate then began a rapid climb. In July, 2002, it finally increased to 16 ppm for the first time, compared to July, 1992. By January, 2006 compared to 1996, it had increased 19 ppm, and further accelerated in September, 2007 to above a 20 ppm change over September, 1997. This month - March, 2015 - was the first that a global CO2 decadal change by month compared to a decade earlier rose by more than 21 ppm. From its low decadal change of 13.56 ppm to the highest of 21.17 ppm, the global CO2 change rate increased by 7.61 ppm or 56%. One problem with the previous chart is that we are only really comparing the change in two data points 10 years apart. While it still reflects the increasing trend, it does not capture that change for each month through any given period. To remedy this, I decided to create a cumulative CO2 ppm change table that smooths the data and reduces ENSO variability impacts on the rate of change. The methodology is to calculate the change between any month and that same month in the prior year (as in the first chart above), then total those differences for a ten year period. Thus the 169.17 ppm below is the cumulative decadal change for January, 1981 minus January 1980, through January, 1990 minus January 1989 (120 months). The following chart depicts the cumulative rate of change of any month compared to prior year in any decadal period from January, 1990 to March, 2015. While January, 1990's cumulative rate was 169.17 ppm, the cumulative decadal change rate dropped to 142.42 ppm in April, 1998. After this month, the cumulative rate index experienced rapid increase, hitting 180 ppm change in June, 2002, 190 ppm in January, 2003, and above 200 ppm in September, 2003. With longer periods of ENSO neutral and La Nina SST's, the index slowed the cumulative change rate, not exceeding 210 ppm until April, 2006. Impacts of another El Nino led to the cumulative change rate exceeding 220 ppm in January, 2011. Since that time, the highest cumulative decadal rate has been 225.31 ppm in May, 2014. If the current El Nino continues to develop into a strong or "super" event, then it is quite possible that the cumulative decadal monthly change will exceed 230 ppm in the next year. 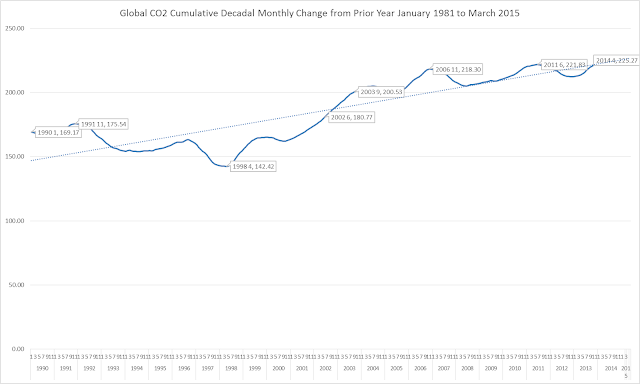 By taking the global cumulative decadal change and dividing by 120, one is able to determine the average cumulative decadal change rate for any month in the NOAA ESRL data since January, 1990. In January, 1990 that average cumulative rate was 1.4098 ppm, which slowed to 1.1868 ppm in April, 1998. After that the rate, began a steady increase, reaching 1.50 ppm for the first time in June, 2002, then accelerating to 1.60 ppm in February, 2003. The cumulative change rate rose above 1.70 ppm in March, 2004 and broke through 1.80 ppm in September, 2006. The highest average cumulative decadal change rate has been 1.8776 ppm, reached during May, 2014. The impacts of the intensifying El Nino, ocean warming, global fires and human emissions, will most likely drive this average decadal cumulative rate above 2.00 ppm in the next year. It is an indicator, that despite rhetoric and hard negotiation on climate, much needs to be done. It is not clear if enough will be done soon enough to avoid increasing natural emissions. 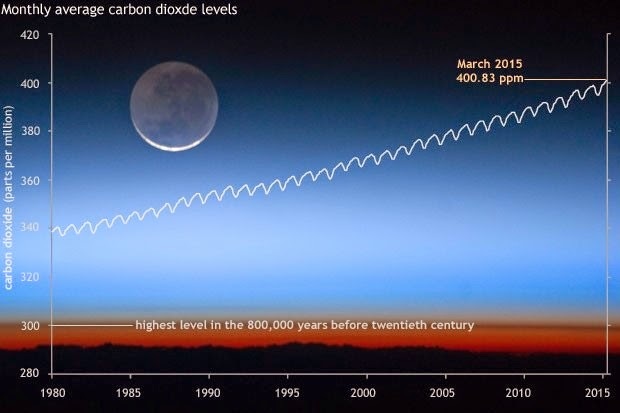 James Butler, director of NOAA’s Global Monitoring Division, has stated it will be difficult to reverse increases of greenhouse gases driving increased atmospheric temperatures.